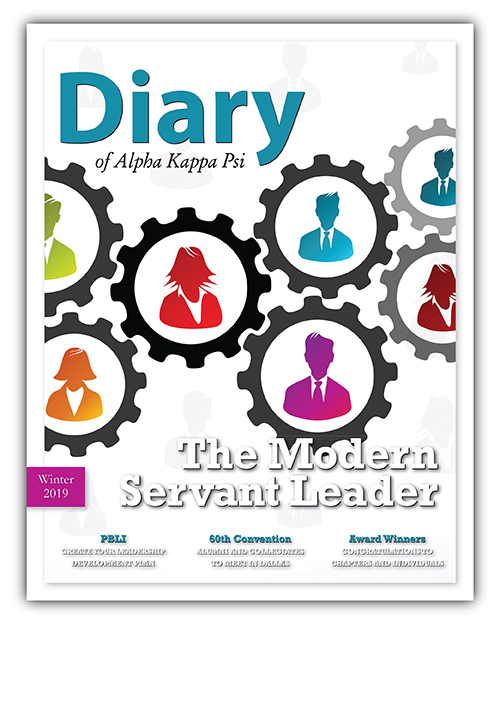 The Diary of Alpha Kappa Psi is the foundation’s award-winning magazine. The winter 2019 issue was mailed in January. The Diary is delivered to Life Members, contributors to the Alpha Kappa Psi Foundation and student members. Successful customer service experiences are built on successful human interaction. When that’s denied, you naturally end up with less favorable experiences. By focusing on your own growth and less on how you stack up to others, you can be sure that you’re not alienating co-workers, but simply elevating yourself and those around you. Servant leadership is about serving the needs of those you lead. Although this model of leadership requires more practice, empathy, and creativity, it has been proven to enhance workplace culture, performance, and results. If you want to ensure 2019 is a year of bountiful blessings for your small business, it is imperative you make a few crucial resolutions now. Updates from alumni around the world. How do I get the Diary? Collegiate members receive the Diary through the payment of initiation fees. The magazine is mailed to chapters in bundles for distribution in the fall, and individually to home addresses in the summer. Life Members have lifetime subscriptions to the magazine, while all Alpha Kappa Psi Foundation supporters and Phoenician Society members receive the magazine for the year of their contributions (a gift of any size will ensure a one-year subscription). Email your old and new addresses to mail@akpsi.org. You may also call (317) 872-1553, fax (317) 872-1567, or send postal mail to 7801 East 88th Street, Indianapolis, IN 46256-1233. If you have a letter to the editor, alumni news, tip, or story idea, you can submit them for consideration. Catch up on past issues of The Diary.